Regulating and matifying overly active sebum glands is a main priority for those with oily skin. If your skin is oily, you will know that there’s nothing worse than carefully applying your make-up in the morning, only for it to have slipped halfway down your face by lunchtime. There is help at hand, though – and all it takes are a few small changes to your skincare regime. Although there are by no means any restrictions for wiping or blotting away excess oil, this will only have a limited effect on shininess. For immediate and long term results, hyperseborrhea (overproduction of oil) must be counteracted by using skin care products that contain matifying powders or seboregulating agents. Aim for a daily skincare product that aims to keep skin matte and regulated all day long, such as the Vichy Normaderm Pro Mat, £14.00. Not only will the fluid keep oil at bay, but it also purifies the complexion and protects from damaging UV rays. Using lots of different products can overload the skin, blocking pores and resulting in blemishes and an overproduction of oil. This excess sebum production can be a nightmare, though there are ways to stay fresh and matte for longer by streamlining your routine. 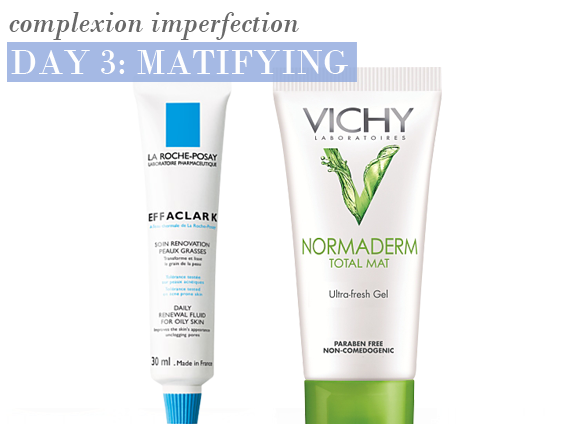 Opt for pore refining products such as the Vichy La Roche-Posay Effaclar K Daily Renewal Fluid, £12.50, that will matify, purify and perfect the skin – all in one simple step. I am in my mid-forties and have fair, freckled skin which is oily in the t-zone and less oily on the cheeks. In hot conditions, I tend to become oilier, and I also suffer from spots on my jawline, linked to hormonal imbalances. This Vichy moisturiser is the good quality you expect from the brand, and it does indeed leave my skin matt and keep it matt (apart from when the temperature is in the 90s, when nothing can hold back the oil). However, unlike many mattifying moisturisers, this one hydrates my skin, so I don't get tight or itchy skin on my cheeks, and my wrinkles don't get any worse. This moisturiser neatly balances my ageing skin's need for hydration with my desire not to look like an oil slick. Furthermore, it doesn't make me break out in spots and is 'safe' to carry on using as my daily moisturiser when I am suffering with an attack of the zits. I use the Normaderm Night to help deal with the spots, as that seems to be stronger. This is gentler for daily use and just keeps things under control. I recommend this. It's a repurchase, which says a lot. It's a great daily moisturiser which does everything I need it to. And I'm awkward and demanding. This entry was posted on Wednesday, October 27th, 2010 at 8:25 am and is filed under Hints & Tips, Skincare. You can follow any responses to this entry through the RSS 2.0 feed. You can skip to the end and leave a response. Pinging is currently not allowed.